Inspired by the Sparrow and Kestrel linen yarns made by Quince & Company, this collection uses geometric shapes and unusual construction to provide adventurous knitters with 10 new designs that are perfect for wearing in the warmer months. 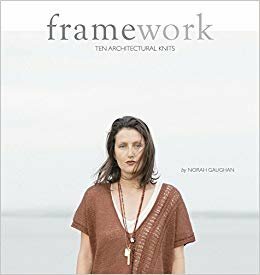 True to form, the author makes use of her masterful understanding of the knitted stitch and characteristics unique to plant fiber types like linen to create unconventional designs. The book includes patterns for three tees, two short-sleeved open cardigans, a shrug, a poncho, a tank top, a scarflet, and a shawlet. The pieces feature eyelets, dropped stitches, cables, and mesh to be used alone or in combination. These projects are far from basic, garden-variety pieces—each one a bold statement of modern style.